Thiotepa is used to treat lymphoma and cancers of the breast, ovary, bladder, and other cancer types. It may also be used to control the fluid that can build up in body spaces (such as the abdomen) where cancer has spread. Thiotepa belongs to a group of chemotherapy drugs called alkylating agents. It slows or stops cancer cells from growing, causing them to die. Thiotepa belongs to the group of medicines called alkylating agents. It is used to treat some kinds of cancer. 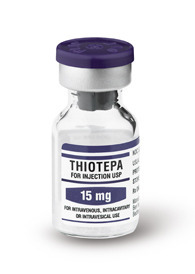 Thiotepa interferes with the growth of cancer cells, which are eventually destroyed. Since the growth of normal body cells may also be affected by thiotepa, other effects will also occur. Some of these may be serious and must be reported to your doctor. Other effects, like hair loss, may not be serious but may cause concern. Some effects do not occur for months or years after the medicine is used. Thiotepa is a cancer (antineoplastic) medication. Thiotepa interferes with the growth of cancer cells and slows their growth and spread in the body. Thiotepa is used in the treatment of cancers of the breast, ovary, bladder, and others. 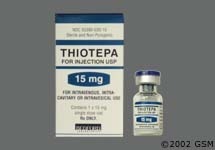 Thiotepa is chemotherapy that is given as a treatment for ovary or breast cancer. The purpose of chemotherapy is to control your illness so that your own body can aid in your recovery. It is important to build up your body’s defense system, and a balanced diet is needed to build a healthy body. Ask your doctor for advice on your diet.